A crowd of more than 70,000 were at a sun-drenched Silverstone on Sunday, enjoying the successful return of Motorcycle Grand Prix racing to the Northamptonshire circuit. Fiat Yamaha Team rider Jorge Lorenzo celebrated his third win of the MotoGP season, having started from pole position on Silverstone’s new Grand Prix Circuit. Over 145,000 fans experienced a festival of two-wheeled motor racing over all three days of the event, making the most of Silverstone’s new and improved spectator facilities. More than 25,000 attended on the Friday, while a crowd of just under 50,000 headed to the circuit for qualifying on Saturday. 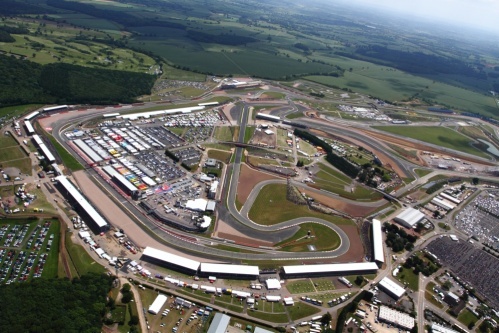 The 2010 AirAsia British Grand Prix was the first bike event to inaugurate the new 3.666 mile Grand Prix Circuit and the riders were full of praise for the fast, flowing nature of the new circuit layout. While Lorenzo stole the headlines in the MotoGP class, the British crowd was also treated to a podium finish by British 125cc rider Bradley Smith. Brits Danny Webb and Scott Redding also put in strong performances in front of their home crowd, finishing tenth and fourth in the 125cc and Moto2 races respectively. Away from the track, a number of celebrities added even more glamour to the occasion, including Dame Kelly Holmes, Matt LeBlanc and F1 personalities Mark Webber, Karun Chandhok, Martin Brundle, Johnny Herbert and Anthony Davidson. Tickets for the 2011 AirAsia British Grand Prix are now on sale.